BB Meow Mix is our feature-rich Bollinger Band overlay. The full, more experimental version of BB Meow Mix supports roughly 10 different moving average types using band width calculations that measure STDEV relative to the particular average used instead of SMA. Moreover, it supports STDEV calculations based on the spread in calculating the average for the current bar or the moving STDEV calculated based on spread between moving price and average, as well as volume-weighted calculations. (This requires custom functions making heavy use of loops in Pinescript; the calculation can occasionally times out and requires refreshing the chart. The "lite" version of BB Meow Mix script is a more stripped down version. The "lite" version is limited to using SMA and regular STDEV (normal BBand logic). It plots up to 4 custom BBands at once with a menu of built-in default period lengths and width pertinent to volatility theory and the strategy taught at Shark Charts, and also supports displaying several additional MA lengths without bands. Default colors have been chosen to provide reasonable contrast and viewability even while using many bands. 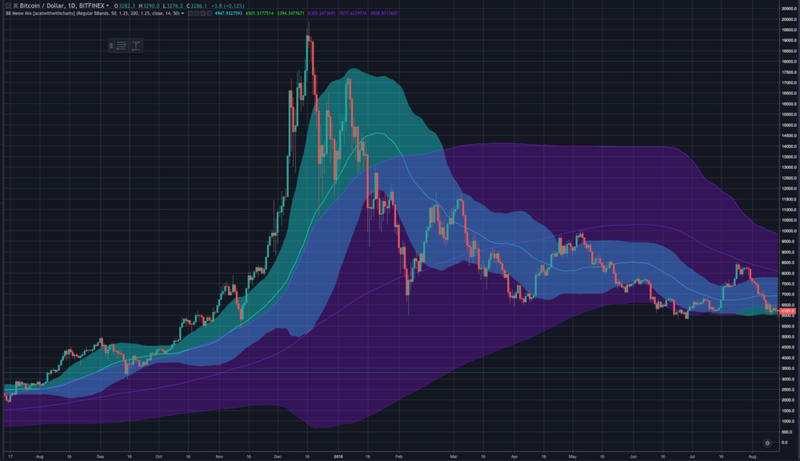 This is an adaptation of the WAVE-PM script, originally published in Mark Whistler’s book “Volatility Illuminated” as a MT4 script, which is itself built on the idea of measuring expansion and compression of Bollinger Bands. It compares expansion and contraction of volatility on different period lengths as a leading indicator that significant trending is probable. WAVE-PM is, in of itself, a non-directional derivative of volatility, and is intended to be used in combination with other deviation-based indicators like BBands and CCI which offer directional indications. In general, a reading below 0.4 indicates high compression, 0.7-0.9 indicates a sweet spot for continued trending on that period length, and 0.9+ indicates overexpansion on that period length; of particular relevance are short period length expansions that occur into and cross up longer period lengths that have finished compression and are beginning to expand again. An option to color code the trace based on whether it is currently rising or falling is included. 3D WAVE-PM is an (il)logical extreme adaptation of WAVE-PM. Instead of displaying WAVE-PM as several oscillator lines oscillating within a range, it plots 32 different period lengths at height equal to their length and reads out colors based on their value. The period lengths are spaced out such that it makes a relatively continuous heatmap when displayed on log scale. It has the same customization options as the WAVE-PM Meow Mix script. 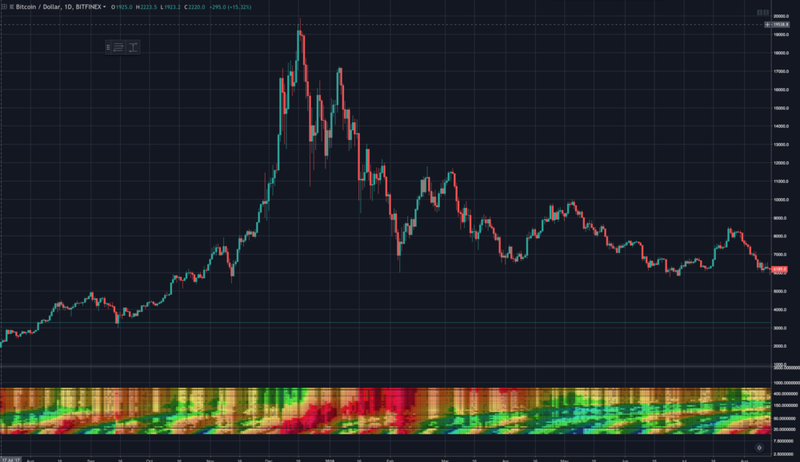 Light and dark colors are utilized to visualize whether the oscillator trace on that period is increasing or decreasing, as determined by comparing to an average of the past few readings. Empirically I found a lookback length of 4 to offer a reasonable balance between reacting quickly and filtering noise; this setting is customizable. Mean Reversion MA is an experimental indicator which tracks the furthest overexpanded period on a given timeframe as a target for eventual mean reversion. It currently allows for plotting BBands around that period and keeps track of the MA broken on the previous expansion and mean reversion. It is limited to SMA and regular STDEV in order to achieve useful precision without always timing out PineScript. Even still, it will sometimes time out and need to be refreshed by either switching TF/symbol or reapplying the indicator. This full version caps the maximum period length at 2000 and can take an especially long time to calculate with more frequent timeouts. Therefore, a version capped at 600 is also available which should load faster and be more stable, but may more frequently require looking at higher TFs due to capping out on extreme movements. 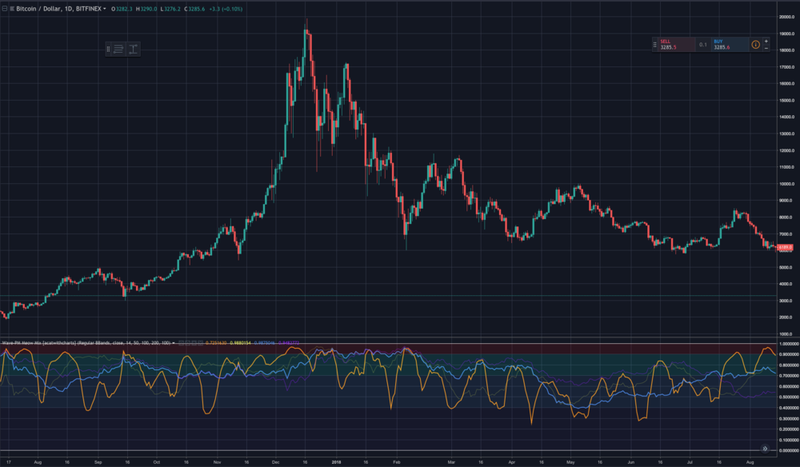 The display color of the MA changes to orange when the period is maxed out as a warning that the maximum has been reached and that the true further overexpanded period is likely to be further out. A limitation of this tool is that it is difficult to track multiple overexpansions of size smaller than a previous one that has not yet reverted within the limitations of Pinescript. Some tools for filtering out large, long-term expansions include the ability to cap tracking at a certain number of bars and to set a lower maximum period length for tracking. Mean Reversion Period Tracker is an adjunctive indicator to Mean Reversion MA for quickly determining which period length is currently being tracked. It works similarly, but instead of plotting the tracked MA, it reads out the period length being tracked in a separate window. This is particularly useful for identifying period lengths of interest and manually setting BBands to look for pivots. A limitation of this tool is that it is difficult to track multiple overexpansions of size smaller than a previous one that has not yet reverted within the limitations of Pinescript. Some tools for filtering out large, long-term expansions include the ability to cap tracking at a certain number of bars and to set a lower maximum period length for tracking. These indicators are derived from 3D WAVE-PM (Lite) and are designed to be used as 3 indicators on the same panel to track 3 times as many period lengths for higher resolution readings. A set with lengths chosen for log scale and another for linear scale are included. All 3D indicators have a tendency to lag browser windows on Pinescript, and especially so when you attempt to alter the settings. These versions are intended for use with 3 of them in one window, which multiplies the problem and may not be suited to general use. The “Lite” tier is designed to be a low-cost package that has the bare minimum toolset to trade the volatility-based strategy taught at SharkCharts. It includes BB Meow Mix Lite, Wave PM Meow Mix Lite, and CCI with WAVE-PM highlighting. 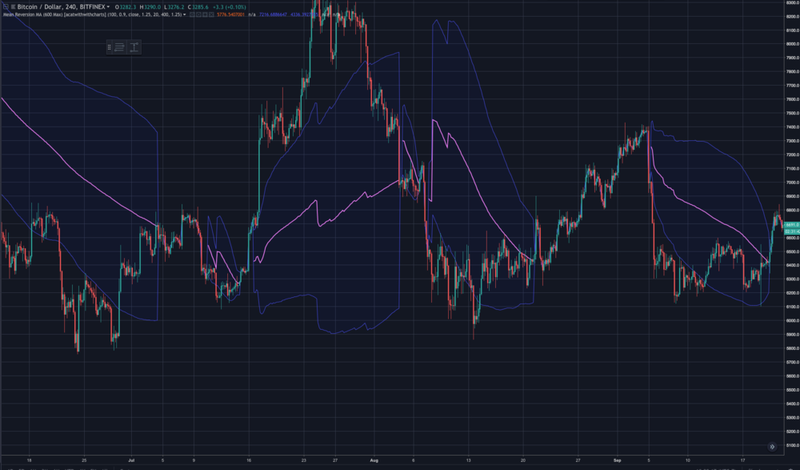 Since BB Meow Mix (Lite) allows for multiple Bollinger Bands and additional moving averages to be loaded from a single indicator, it is possible to get a comprehensive chart analysis from the free version of TradingView which limits you to three indicators. The “Full” tier is our full-featured package which adds our more complex indicators. 3D WAVE-PM Lite, 3D-WAVE-PM, Mean Reversion MA, and Mean Reversion Period Tracker are the major additions from the previous tier. It also includes the full versions of BB Meow Mix and WAVE-PM, which add support for a wide variety of moving average and standard deviation types. The “Full + Experimental” tier is designed to be a “full-featured package + buy the developer a coffee” tier. It adds access to the high-resolution 3D WAVE-PM indicators to provide the most pinpoint readings of mass, as well as other experimental and supplemental indicators that may be rough around the edges. While we cannot promise that any new indicators will be launched during any particular subscription period or timeframe, we intend for this tier to get first access to anything new that we build before we refine and add it to the “full” tier.